It´s centric location and it´s excellent communication with other means of transport have converted the train station María Zambrano into an interesting reference point for both travel and leisure in the Costa del Sol´s capital Malaga. The Train Station is situated next to the Bus station, 2 km from the Malaga harbor and 9 km from Malaga Airport with which it is connected by the suburban train (Cercanías) C-1. From María Zambrano railroad station leave the before mentioned suburban train, middle and long distance trains and the high-speed Train AVE, with destinations to Córdoba, Madrid and Barcelona. The bus station with a wide range of services to the whole province is conveniently situated just across the street. In 2004 opened the VIALIA Station in Malaga, which is with 63.000 square metres the major one in Spain. 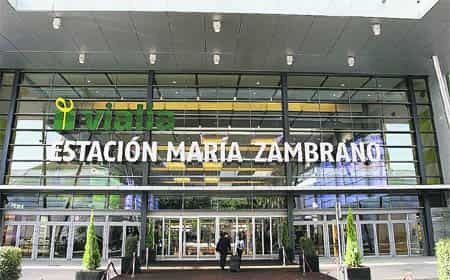 VIALIA has an underground parking and all the railway services of its category, such as VIP lounges, Travel centre, check in etc, and as well a four star Hotel (Hotel Barceló Vialia). 30.000 square metres are dedicated for commercial surface with a total of 121 shops, including as well a cinema with ten movie theatres. The majority of the stores open as well on Sundays. Bus Lines: 1, 3, 4, 5, 10, 12, 16, 1 9, 24 and 27. The train station Malaga Maria Zambrano was constructed over the old railway station, refurbished and also has AVE High speed train; it is situated very close to Malaga city centre and is very well connected with the entire Costa del sol; furthermore it has a commercial centre Vialia and a four star hotel. Among the services offered by the commercial centre are an underground parking, 10 cinemas and more than 100 shops. The station is opened from 5 am to 12:45 am. Tickets can be acquired from 6 am to 9:30 pm and can be collected during the same timetable when they have been purchased over the phone. The baggage rooms are available from 7 am to 11 pm. The train station in Malaga has connections with Torremolinos, Benalmadena, Fuengirola, Churriana and many other destinations from the closeby Bus Station. The distance is 9 kilometres; you can take the suburban train in the Train station which will bring you directly to Malaga Airport. what train station in torremolinos ? For more information try our forum, no registration required.